Think life is better down where it’s wetter? You’ll want to make this mermaid smoothie bowl for breakfast! This purple smoothie bowl is not only healthy and pretty, it’s also super simple to make! I know how hard it is to eat healthy for more than a week. Even a couple of days can feel like pure torture. Boredom sets in and all you crave is something that is carb loaded or deep fried. Ohhhh, I know that feeling all too well. So I try to avoid it. And whenever we’re trying to eat healthier, I try my best to get creative. My main focus is to make the dishes we enjoy both delicious and appealing. Which is exactly what today’s dish is. Not only is this mermaid smoothie bowl recipe a healthy way to start your day, but it’s also super pretty. One of my favorite things about this purple smoothie bowl is that it’s a family favorite. Our daughter loves it and so do we! 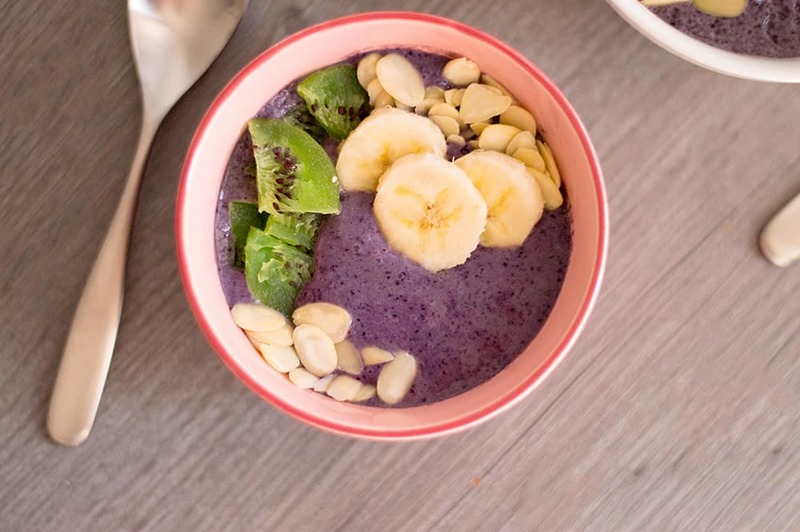 This healthy, simple smoothie bowl is made with blueberries, bananas, milk (your choice of what kind – I prefer unsweetened vanilla almond milk), honey, Greek yogurt, dried kiwi, and slivered almonds. No crazy ingredients. Just healthy ingredients that are most likely already in your fridge or pantry. Not only is it a great breakfast for the whole family, it’s the perfect kind of mermaid food for all of us who need a little vitamin sea. It’s a unique mermaid party food idea that’s great for brunch or kicking off a mermaid birthday party themed day. Add the blueberries, whole banana, milk, honey, and Greek yogurt in a blender. Top with kiwi, slivered almonds, and banana slices. You can use whatever type of milk you prefer. We generally use unsweetened almond milk, vanilla or plain. Whether you’re looking for a delicious way to start the day that’s equally healthy as it is pretty or if you’re looking for a unique mermaid food ideas – this mermaid smoothie bowl is a simple, tasty choice for kids and adults alike. No matter the occasion, this beautiful purple smoothie bowl is a huge hit! Want to remember this mermaid smoothie bowl recipe? Post this delicious purple smoothie bowl to your favorite Pinterest board!